206 pages | 2 B/W Illus. 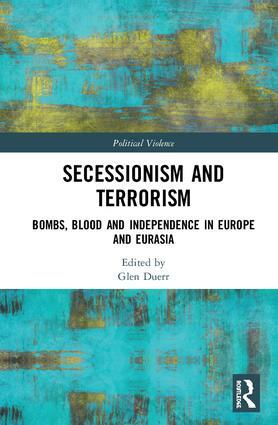 This book examines secessionist terrorism in a comparative context across Europe and Eurasia. The volume seeks to uncover comparative linkages between terrorism and secessionism; specifically examining terrorist organizations that also have a political goal of independence. It examines a wide range of case studies, including the IRA in Northern Ireland, ETA in the Basque Country, FLNC in Corsica and ARD in Brittany, KLA in Kosovo, PKK and TAK in Turkish Kurdistan, and IK in Chechnya. In doing so, the book shows the linkages in terrorist tactics and demands, as well as when and how ceasefires come into place. Ultimately, none of the terrorist organizations studied here has obtained their maximalist goal of gaining independence, but each has caused significant bloodshed, and has contributed to the debate on the future of governance in Europe and Eurasia. The major strength of this format is to glean wider lessons on ethno-nationalism, as well as the causes and outcomes of terrorist actions. Each case study also updates the literature on the individual cases to provide the most recent account of events in these countries. This book will be of much interest to students of terrorism and political violence, ethnic conflict, nationalism, European politics and International Relations in general. Glen M.E. Duerr is Associate Professor of International Studies, Cedarville University, USA, and is author of Secessionism and the European Union (2015).